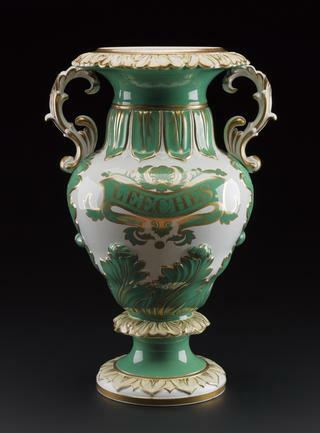 Milk jug, ceramic with pewter lid, Southern Railway, made by John Maddock & Sons Ltd, Burslem - 'Royal Vitreous'; white with Southern Railway garter in green. Overall: 110 mm x 125 mm x 88 mm. Side dish, ceramic, by Dunn Bennett & Co, Burslem, Great North of Scotland Railway, crescent shaped, white with gold edged blue band, black Great North of Scotland Railway coat of arms. Plate, ceramic, London Midland & Scottish Railway, "Royal Venton Ware" made by John Steventon & Sons Ltd, Burslem; white with gold rim, pink and green floral design, marked underneath " L.M.S." Overall: 19 mm x 191 mm. Ashtray, ceramic, 'CCPR Lilleshall', made by Dunn Bennett & Co, blue. 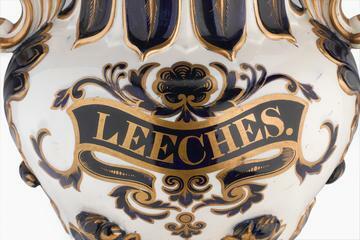 Milk jug, 1/2 pint, ceramic, London Midland & Scottish Railway, made by Dunn Bennett & Co Ltd, Royal Victoria Pottery, Burslem; cream, with 2 gold bands, marked underneath "L.M.S." Overall: 103 mm x 105 mm x 77 mm. Teapot, ceramic, Glasgow & South Western Railway - Hotels, made by Dunn Bennett & Co, Burslem; white with gold rim, green chequered band below rim and crown, staff & trident motif on one side with "G & S.W. RLY Hotels" below. No lid attached. Measurements: 78 mm x 169 mm 104 mm. Sauce boat stand, ceramic, by Dunn Bennett & Co, Burslem, Great North of Scotland Railway, oval, white with gold edged blue band, black Great North of Scotland Railway coat of arms. 9 x 6.5 in. Saucer, ceramic, Great Western Railway - Hotels, made by John Maddock and Sons Limited, Burslem; cream with red and black bands and " GWR" in red diamond, marked underneath "GREAT WESTERN RAILWAY HOTELS", 5" diameter. Egg cup, ceramic, Great Western Railway - Hotels, made by John Maddock and Sons Limited, Burslem, 1940; cream withred and black bands and "GWR" in red diamond, marked underneath "GREAT WESTERN RAILWAY HOTELS 3/40". Sugar bowl, ceramic, Great North of Scotland Railway - Refreshment Rooms, Ballater made by Dunn Bennett & Co, Burslem; white with blue motif, GNoSR coat of arms with "REFRESHMENT ROOMS BALLATER" below. Tea plate, ceramic, Dunn, Bennet and Company Ltd, Glasgow & South Western Railway - Hotels; G & SWR Hotels full crest, blue on white, 1900-1923. Measurements: 26 mm 213 mm. 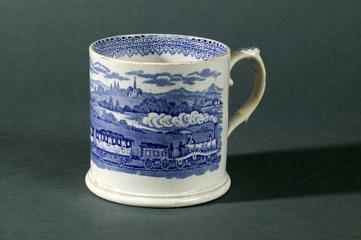 Mug, ceramic, by Dunn Bennett & Co, Burslem, Great Northern Railway, large, white, blue motif, GNR coat of arms surrounded by 'GREAT NORTHERN RAILWAY REFRESHMENT DEPARTMENT'. Plate, ceramic, London & North Western Railway - Loco Department, made by Dunn Bennett & Co, Burslem; white with blue coat-of-arms, marked 'L&NWR LOCO DEPT.' 25.4 cm. Plate, ceramic, by Dunn Bennett & Co Ltd, Royal Victoria Pottery, Burslem, London Midland & Scottish Railway, white, with double thin blue band, LMS coat of arms on rim with 'GSW' below. 9.5 in. Saucer, ceramic, London & North Eastern Railway, circular, white with blue floral design and two bands, female figure with child and "Felix Hotel" logo. 12.065 cm. Plate, ceramic, by Wood & Sons Ltd, Great North of Scotland Railway, white with double thin blue band and blue motif, GNoSR coat of arms, with "DINING ROOMS" below. Condiment tray, ceramic, by Dunn Bennett & Co, Burslem, Great North of Scotland Railway, white, 3 sections, green motif, Great North of Scotland Railway coat of arms surrounded by 'ABERDEEN REFRESHMENT ROOMS'. Plate, white with green and gold decoration, good condition, used by Pullman, makers mark on base. 8.8 in. ; 22.352 cm. Side dish, ceramic, London Midland & Scottish Railway - Gleneagles Hotel, made by Wood & Sons Ltd, Burslem; crescent shape, white, black and gold decorative border, marked "Gleneagles Hotel" on side and "LM&S HOTELS" underneath. Teapot, ceramic, Southern Railway, brown, Southern Railway garter, made by Dunn Bennett & Co., Royal Victorian Pottery. 7.62 x 10.414 cm. 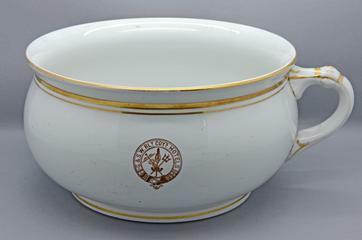 Cup, ceramic, London & North Western Railway, made by Dunn Bennett & Co, Burslem; white with blue and gold rim, with Britannia logo. 6.985 x 3.81 cm. Soup plate, with stand, ceramic, London & North Western Railway, made by Dunn Bennett & Co, Burslem; white with blue and gold border, marked with LNWR Britannia logo. 5.715 x 24.13 cm. Soup plate, ceramic, London Midland & Scottish Railway - Gleneagles Hotel, made by Wood & Sons Ltd, Burslem; white, black and gold decorative border, marked "Gleneagles Hotel" on rim and "LM&S HOTELS" underneath. 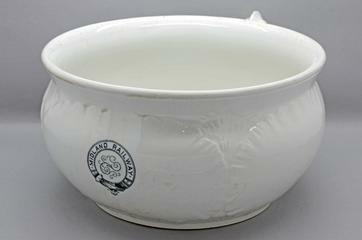 Saucer, ceramic, Great Western Railway, made by John Maddock & Sons Ltd, Burslem - "Royal Ivory"; white with "G.W.R." in red sans serif letters. Overall: 19 mm x 127 mm, 0.08kg. Egg cup, ceramic (earthenware), by Doulton, Midland Railway Severn Border M R Steamboats, white with brown printed pattern . Overall: 60 mm x 55 mm, 0.07kg. Ceramic saucer from tea/coffee service presented to Mr. Robert Wilkie, Station Master at Hexham on his promotion to Corbridge station, 26 September 1882. Made by Edge, Malkin & Co. Overall: 27 mm x 167 mm. Doulton, Burslem plate, Midland Photo-Keramic Company. Carbon photograph under glaze; gilt floral decoration. Milk jug, white ceramic with hinged metal (pewter?) lid, dark green printed Southern Railway garter on front. Made by John Maddock and Sons Limited, Burslem. Overall: 100 mm x 96 mm 72 mm, 0.19kg. Saucer, ceramic, Great Northern Railway, made by Royal Doulton, Burslem; white, three printed thin blue bands and blue motif, GNR coat of arms surrounded by "GREAT NORTHERN RAILWAY REFRESHMENT DEPARTMENT". Measurements overall: 24 mm x 155 mm, 0.18kg. Plate, porcelain, Glasgow & South Western Railway - Hotels, made by Dunn, Bennett and Company Limited, Burslem; oval with gilded edge, painted pink rim and white centre, brown printed design around edge, crest in centre with "G & SW Railway Hotels" below. Overall: 35 mm x 296 mm x 184 mm, 0.46kg. Ceramic side plate from tea/coffee service presented to Mr. Robert Wilkie, Station Master at Hexham on his promotion to Corbridge station, 26 September 1882. Made by Edge, Malkin & Co. Overall: 24 mm x 212 mm (dia. rim). Ceramic tea cup from tea/coffee service presented to Mr. Robert Wilkie, Station Master at Hexham on his promotion to Corbridge station, 26 September 1882. Made by Edge, Malkin & Co. Overall: 73 mm x 127 mm x 102 mm. Side dish, ceramic, Great North of Scotland Railway, made by Dunn Bennett & Co, Burslem; crescent shaped, white with gold edged blue band, black Great North of Scotland Railway coat of arms at top. Overall: 24 mm x 195 mm x 150 mm, 0.24kg.